This is the first scientic book devoted to the Pauli exclusion principle, which is a fundamental principle of quantum mechanics and is permanently applied in chemistry, physics, and molecular biology. However, while the principle has been studied for more than 90 years, rigorous theoretical foundations still have not been established and many unsolved problems remain. Following a historical survey in Chapter 1, the book discusses the still unresolved questions around this fundamental principle. For instance, why, according to the Pauli exclusion principle, are only symmetric and antisymmetric permutation symmetries for identical particles realized, while the Schrödinger equation is satisfied by functions with any permutation symmetry? Chapter 3 covers possible answers to this question. The construction of function with a given permutation symmetry is described in the previous Chapter 2, while Chapter 4 presents effective and elegant methods for finding the Pauli-allowed states in atomic, molecular, and nuclear spectroscopy. Chapter 5 discusses parastatistics and fractional statistics, demonstrating that the quasiparticles in a periodical lattice, including excitons and magnons, are obeying modified parafermi statistics. 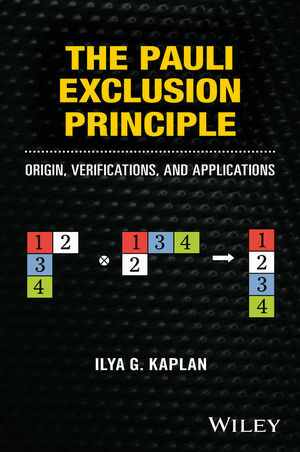 With detailed appendices, The Pauli Exclusion Principle: Origin, Verifications, and Applications is intended as a self-sufficient guide for graduate students and academic researchers in the fields of chemistry, physics, molecular biology and applied mathematics. It will be a valuable resource for any reader interested in the foundations of quantum mechanics and its applications, including areas such as atomic and molecular spectroscopy, spintronics, theoretical chemistry, and applied fields of quantum information. Ilya Kaplan has been studying the Pauli Exclusion Principle for more than 35 years and is a well-known scientist in this field. He has published 4 books in Russian, 4 books in English, including the Wiley title Intermolecular Interactions, and 11 book chapters, one of which was devoted to the Pauli Exclusion Principle. He was also an Associate Editor for Wiley's Handbook of Molecular Physics and Quantum Chemistry, published in 2003.